On November 27, 2018, NASA celebrated the landing on Mars (the specific word for Mars does not yet exist) of its "Insight" probe. 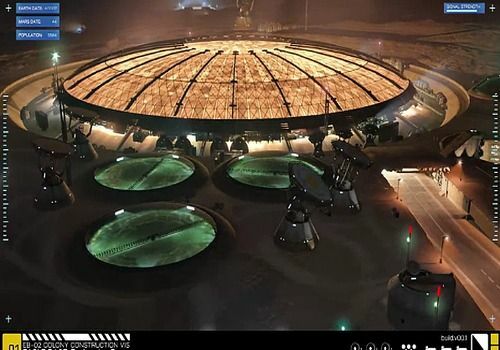 To mark the event, the developer BlackBird Interactive is making its "Project Eagle", a special kind of simulator available to everyone free of charge, since it invites you to take a walk around a colonial base on the Red Planet. Without interacting, you will be able to stroll through the various external structures of this scientifically accurate representation, developed in partnership with a team from NASA. Discover the vehicles, buildings, launch lamps, solar panels, radars... that will populate the "Gale" crater, where this base is located, at the base of Mount "Sharp". For fans, know that the ground is faithful to the data collected by HiRise, the orbital surveillance system set up. So you won't have much to do on Mars, except maybe admire the Martian landscapes and see how vehicles move on the dusty surface of what is the greatest future conquest for mankind. BeamNG is a software still in alpha version which is in fact a driving simulation that offers a particularly powerful engine in its damage and collision management. Welcome to the Clinic-De-Lux Hospital where doctors face a mysterious epidemic that replaces the heads of Two Point County residents with blisters. Football Manager 2019 is a management game in which you have to train a team to take it as far as possible. Managing strategies, press and media relations are the daily tasks of a coach. A 3D train simulation game. Take control of several freight trains to get them to their destination points within the time limit!